3.11.11 is a date forever imprinted on the memories of Japanese and other persons who were in Japan on that fateful day. A massive tsunami launched by a ‘thousand-year’ magnitude 9.0 earthquake inundated 400 miles of Pacific coastline north of Tokyo – about the distance from San Francisco to Los Angeles. It took the lives of 18,000 people and swept away farms, homes, fishing villages and whole cities. In the days following, multiple hydrogen explosions and meltdowns at the Fukushima Daiichi (No. 1) Nuclear Power Station, 160 miles north of Tokyo, forced the evacuation of 140,000 citizens who had to abandon pets, livestock, farms, and businesses, tearing apart centuries-old ways of life. Almost four years later, we in the U.S. hear little about the aftermath of the nuclear accident and on-going policies of government agencies and Tokyo Electric Power Company (TEPCO) — who built the plant in rural Fukushima to supply power to Tokyo — in dealing with the contaminated land, sea, air and the daily lives of the ‘nuclear refugees’ who cannot return home. This unusual collection of poems fills a gap in our understanding of the human impact of nuclear power on the people of Fukushima prefecture, on Japanese society, and on all humanity. Here is a rare chance to hear fifty Japanese poets speak to us directly in strong, clear voices, unfiltered by media or government. Originally composed in Japanese, skilled translators have made the poems accessible to English readers. 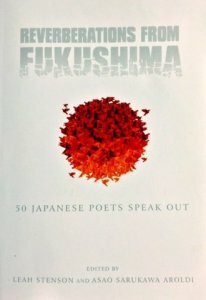 The fifty poems originally appeared in a larger Japanese-English edition entitled, Farewell to Nuclear, Welcome to Renewable Energy: A Collection of Poems by 218 Poets, edited by Hisao Suzuki, Jotaro Wakamatsu, et. al. (Tokyo: Coal Sack Publishing Company, 2012). The volume opens with a preface by editor Leah Stenson followed by several essays and commentary by Suzuki, Wakamatsu, and others, that inform and give historical context to the poems. Following are excerpts from eight poems in the anthology, which address a range of themes from fear, betrayal, contamination, nature’s bounty, and love of ones home, to the politics of secrecy and the human significance of technological failure. In “A Phantom Country of Civilization – From Hiroshima to Fukushima,” Ryu Nishida reveals the repeated mistakes of the country’s leaders and people, who followed in the dark. the people of the country chose, without logic, the way of darkness. carrying the darkness of Hiroshima and Nagasaki on its back? The last stanza is full of powerful imagery regarding the current situation. no one can see it, or has any way to deal with it. we stand, motionless, in the flow of time that passes from life to death. Note: From 1962, Japan built 54 nuclear power plants that supplied a third of the country’s energy needs. All were shut down after the meltdowns at the Fukushima plant. There is fierce political, scientific, and social debate over whether and when to restart them. The government announced intentions to restart the first one, the Sendai nuclear power plant in Kyushu, in early 2015.
and the Iraqi children hit by depleted uranium rounds. that they can return to the place where they were born? of the ripe fruit hanging on the branches. The posture of gaman, or patiently enduring adversity, is a strong culture value in Japan, particularly in rural, traditional communities of the Tohoku (northeast) region, which includes Fukushima prefecture. In “Give Us Back Everything,” Yasunori Akiyama tell us that, “Those driven from their homes by radioactivity” are being treated “as an unimportant minority.” It is time to “locate the source of the pain” and “cry out loudly” to those in positions of power. leaving tooth-marks on the wooden door frames. We must not be patient. To be patient is to run away. To endure is to look away from reality. Give us back our cows! Give us back the fodder! Give us back our homes, farms, grass and trees! Give us back our water, air, insects, fish and birds! Give us back our neighbors! Give us back peace for the babies not yet born! Give us back everything that once was! Give us back the future that is yet to come! As a young woman just out of school, Hatsuko Hara was happy to get a job with TEPCO. Her mother warned her, however, that “The things that people do are not perfect./ A nuclear plant is the same as an atomic bomb.” In her poem she informs the reader of why she terminated her job five months after the nuclear accident. Her message is one of sorrow, betrayal, and a new resolve. I retired from my company. Don’t participate in the anti-nuclear movement. I am a member of Tokyo Electric Power Company. I felt proud to be working for a company that produces electricity. so that we can live without nuclear power. In “Swindling of One Million Years,” Keiichiro Fujitani accuses “Those who transplanted the genes of the sun to this planet!/ Those who shoot arrows to the sun from this tower of Babel!” of ignoring the long-term consequences of the use of nuclear power for short-term gain. Again, nature is a silent witness to the contamination of the environment. where the dandelions and the lotus spread. They eliminate the surface soil and wash the walls and roofs. That is the disguise called decontamination. Where does the real dirt lie? can begin to decontaminate the real dirt. The final two excerpts are from two poets, both born in Fukushima, who reflect on nature’s bounty and the sorrow of losing their homes and way of life that moved in rhythm to the seasons. In “To My Home,” Setsuko Okubo affirms, “Our prime blessing is brought by the soil..inherited and guarded.” In the first and last stanzas, the repetition of the names of wild plants they used to gather serves as a litany. Butterbur sprouts, five-leaf aralia, fatsia sprouts, bracken, and parsley. It’s a season full of life. The smell of rice heralds the harvest. We had to slaughter the cows that we had tenderly watched over. left our houses, fields, and livestock, and evacuated. We drift from shelter to shelter as refugees. Spring has rolled around again. There was a broad sky. There was a deep blue sea. A snowy white sand hill spread out, and deep green pinewoods grew thick. a place where the soul flies. Was it a cry or a scream of excess? Reviewer Bio: Ruthy Kanagy is the author of “Living Abroad in Japan” (2013, Avalon Travel Publishers). Her poems have appeared in Fault Lines Poetry and Eugene 150th Birthday Celebration Poetry Collection. A native Tokyoite living in Eugene, she is mostly retired, loves to hike and travel with her bike, and leads Japan Cycle Tours annually. Ruthy, I cried when I read your review. My heartfelt appreciation for your support. Much thanks for bringing this book to my attention. I have been wondering if Japanese poets would be addressing this very difficult subject. The past can’t be changed, but envisioning a better future will take a good deal of imagination to be undertaken properly. Poets are in a good position to assist in that effort. The are often the most skilled at observing what otherwise goes unnoticed, and saying what otherwise cannot be said. I trust this book will be the first of many offerings helping to do just that.